1Heat oven to 350°F. In large bowl, break up cookie dough. Stir or knead in baking bits and peanuts until well blended. 2Onto ungreased cookie sheets, drop dough by 24 heaping tablespoonfuls 2 inches apart; flatten each slightly with fingers. 3Bake 10 to 14 minutes or until light golden brown. Immediately top each cookie with 1 peanut butter cup; press lightly into dough. Cool 2 minutes; remove from cookie sheets. Let cookies stand until peanut butter cups are set before storing, about 3 hours. Love chocolate? 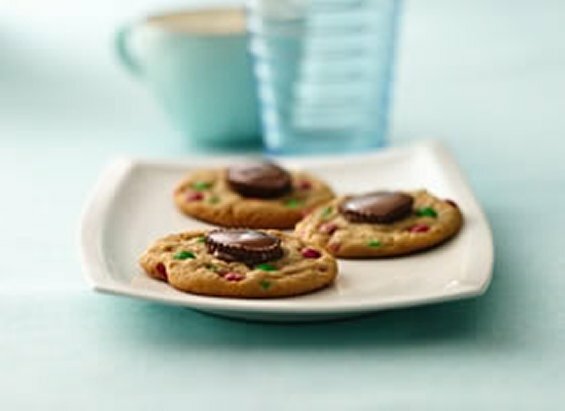 Try it with Pillsbury® Create 'n Bake™ chocolate chip cookies!